Tyre under-inflation is a globally recognised issue threatening the safety of car and HGV drivers alike. Figures from the UK Department for Transport (DfT) highlight the need for motorists to check their tyres regularly, after almost 30% of vehicle defect-related deaths in the UK in 2016 were found to have been caused by illegal, defective or under-inflated tyres. Of the 1,687 total casualties caused by defective vehicles in 2016, 550 (32.6%) of these were caused by dangerous tyres, according to the DfT. One way to reduce the impact of under-inflated tyres is to ensure that all drivers can easily and regularly check their tyre pressures. 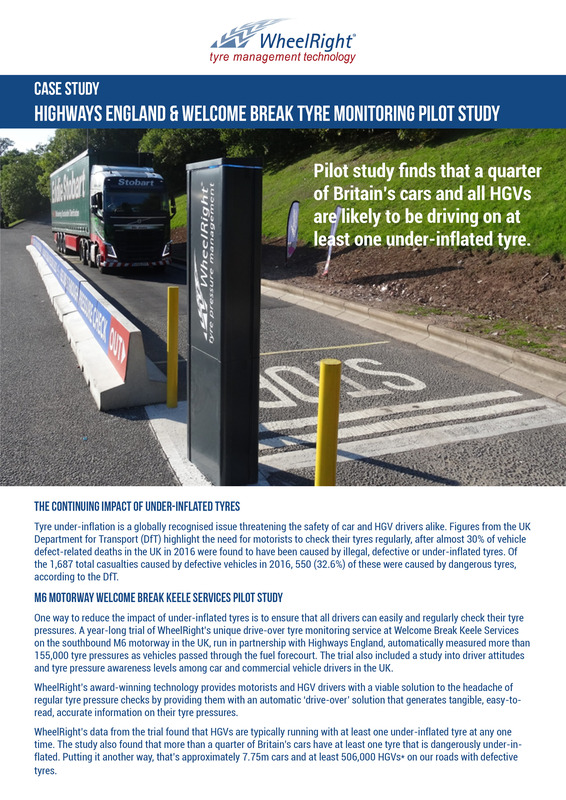 A year-long trial of WheelRight’s unique drive-over tyre monitoring service at Welcome Break Keele Services on the southbound M6 motorway in the UK, run in partnership with Highways England, automatically measured more than 155,000 tyre pressures as vehicles passed through the fuel forecourt. The trial also included a study into driver attitudes and tyre pressure awareness levels among car and commercial vehicle drivers in the UK.